Young Female, Traveling Alone tells the story of a successful western female in her late twenties, who is on the verge of serious depression and leaves her comfort zone behind, embarking on a backpacking journey throughout Southeast Asia and India. I suddenly got dizzy. I felt exhausted and confused. I scanned the images in front of my eyes, but I had a hard time realizing what was happening. This was not the reality I knew. There was too much chaos and too much poverty all around. I had a strong grip on the seat in front of mine. I could have felt my stomach shrinking in fear and moving upward, toward my chest. "Ladies and gentlemen, we are experiencing some turbulence. Please keep your seat belts fastened until the seatbelt sign is off," announced the pilot. I looked around. I was the only female in the vicinity. The Indian men kept staring at me. They had been looking since I got on the plane. The look was intense, and I almost felt it penetrating my skin. The cabin looked run-down. The empty luggage storage bins hung wide-open, flapping in the air. There was water dripping from a rusty spot above a right-side window, and the seat below was missing. My seat kept shaking and so was the one onto which I was hanging. "Turbulence only," said the Indian man sitting on my left side. He probably sensed my fear. I was afraid the plane would not survive through such strong air turbulence. The plane hit a deep air hole and abruptly descended a few meters. I felt hopeless. The aircraft stabilized a few minutes later. The seatbelt lights turned off. I let go of the chair in front and leaned back. I felt the sweat dripping down my chin. I tried to relax. The flight attendants moved around quickly, distributing bread rolls and small white lunch boxes to the passengers. "Is this a vegetarian meal?" I asked the stewardess who had handed it to me. "There is no vegetarian meal on plane." I opened the box, and I smelled the rotten meat. I lost my appetite. "Wait, please." She came back ten minutes later and handed me the water. Half an hour later, we landed in Dhaka, the capital of Bangladesh. The Indian men rushed outside the plane, pushing me out of the way. I had no choice but to move with the flow. I walked along the corridor and entered the waiting room. I sat down. Two young Western guys came to sit next to me. "Are you traveling alone?" asked one of them. "Yes, but right now I wish I had a travel companion," I said. "You can hang out with us." Rick and Johan were friends. Johan was Swedish and Rick was a Kiwi (New Zealander). They met in Sweden. Rick had been away from home for five years. They looked tired. Big dark circles surrounded their eyes. "We partied late last night in Bangkok," Johan said. The plane was two hours late, and there was no sign that it would take off soon. Many Indian men stood by the information desk. I approached the desk. "Do you know what time the plane will leave?" I asked one of the men standing up next to the desk. "Sorry, Madame, don't know," he said. "The plane time two hours ago." I found it funny the way he wiggled his head while talking to me. He shook it fast from side to side. I sat down. An hour later, the Indian men rushed inside the plane, pushing again along the way. This time I sat next to Rick and Johan. 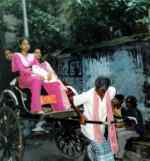 We arrived late at night in Calcutta (Kolkota) and we shared a pre-paid taxi to Sudder Street, the backpackers' district. It felt like a different world - a world after a war. The buildings were run-down. Some had broken windows, and huge dirty spots covered the outside walls. There were garbage piles on the side of the road. I could smell it. The streets were quiet at night. A cow moved nonchalantly along the street. A few metal busses with no window glass were parked along the side. They looked abandoned. "It's not as bad as I imagined, " I said out loud. "You seem to be picking yourself up quickly," Rick said. The three of us looked around in shock. "Sudder Street flooded," said the driver. 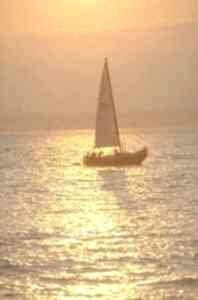 "A lot of water...Two weeks raining," he continued. "I know good hotel." Johan, Rick, and I looked at each other in disbelief. "No, you bring us to Sudder Street now," I told him firmly. It looked like a scam: he would probably bring us to some expensive hotel where he could collect commission. Sudder Street was not flooded. It took us an hour to find a decent open guesthouse. Inside the guesthouse, I looked at three rooms and chose the cleanest of the three. I settled for two hundred rupees. I suddenly started regretting leaving Southeast Asia. In Bangkok, for two hundred rupees, I would have had a clean room with air-conditioning. I couldn't fall sleep. For the remainder of the night, I tossed and turned in bed. I got off the bed early the next morning and took a cold shower. I felt my skin itching. I started inspecting my room. There were a couple black roaches running around. The walls were dirty, and there were a few small blood spots on top of the bed. As I approached to take a closer look at the wall, I saw a couple of tiny white worm-like insects wandering around in my bed. I packed my backpack and went down the stairs. "You told me no bedbugs," I told the guy at the reception. "No bedbugs in guesthouse, Madame. We are clean people." He wiggled his head. "Come and I show you the bedbugs," I told him. He followed me into the room and I showed him the small insects wandering the bed. "Maybe one...or two," He said. He gave me another room with a TV and more bedbugs for 250 rupees. I took it, as I realized all the rooms were the same. I ordered the train ticket to Delhi with the guesthouse. I was going to leave the following evening. I left a note for Rick and Johan, and I went out in the city. Sudder Street looked so much different in the daylight. A few tobacco stores opened for business. On the left side, a couple of rickshaw drivers were lying down, sleeping inside their rickshaws, waiting for passengers. Not far away from them, a cow sat chewing from a pile of garbage. Further down, a couple of men were lying down on bamboo sheets, sleeping. They must have been really poor. A couple of cars crossed each other in the streets, barely missing each other. I tried to make my way through the busy street, passing a few Indians on the way. "Rupees, Madame, please?" A woman walked toward me, begging for money. She carried a baby in her hands. A couple of children followed her. I searched my bag and gave them small change. They continued walking along. "I gave you some, now go away, please." They still followed me. I entered a small restaurant at the corner of the street. I sat down and ordered tea and toast. A few Westerners sat down in the restaurant. They looked rested and calm. I wished I felt that way. I lacked sleep and felt rather anxious. A blond girl quietly sat at the table in front of me, reading a book. She looked beautiful in her blue Salwar Kameez suit. I thought of buying one too. The restaurant looked filthy. The waiter brought me breakfast. He cleaned my table. No matter how hard he cleaned it, it was still dirty. I quickly ate and went back onto Sudder Street. It was hot. I thought of buying a bottle of water. "No good water, Madame," said a young boy passing by. I took the bottle of water I bought from the tobacco shop and looked at it. "This water bad name," he explained. It was another scam to make a few extra rupees. The bottles have been refilled with tap water. As a traveler, the number one survival rule in Asia was to neither drink the tap water nor eat the uncooked fruits or vegetables washed in it. I threw away the bottle and bought a different brand. The bottle was sealed properly. It was safe to drink it. The weather started to get hot. The air was polluted. I had hard time breathing. 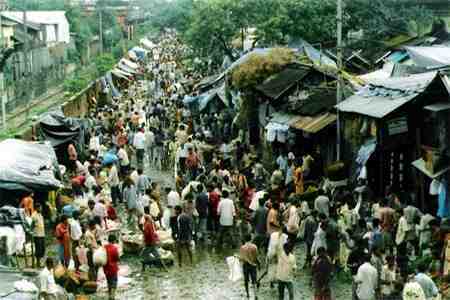 I went inside the market and roamed around, searching for clothes to buy. I had the impression the Indian men's eyes followed me everywhere I went, watching me. "Madame, you need help? I show you nice store." The Indian man started walking along with me. "I will find the stores myself, thank you," I told him. "Madame, you want to buy?" said another Indian man as I approached his store. I bought a red Salwar Kameez suit and put it on. I thought of buying a Bindi, the red dot the Indian women wear between their eyes. "Madame, need help?" The salesman asked. "I give you beautiful Bindi." He took out a bunch of small packets of Bindis of different colors and shapes. He chose one, took it out, and placed it on my forehead. I bought a small pack. Back in the streets, I noticed I was being stared at less than before. It must have been the Indian attire. The traffic was chaotic: cars going in all directions, their horns honking. To my amazement the cars didn't collide. "Why do they use the horns so much?" I asked myself. A strange vehicle passed in front of me: a two-seat and two-wheel rickshaw dragged by a tiny Indian man. Two women sat behind him. On the other side of the street, a few Indian men waited by the bus stop. They wore white pajama-like clothes and slippers. 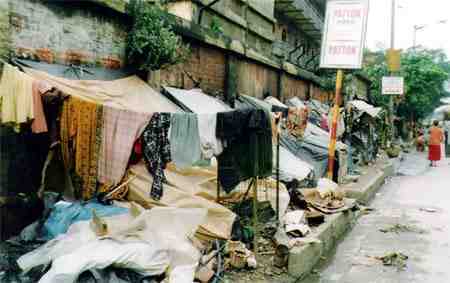 I walked along the sidewalk through the slums of Calcutta. There were blue tents set up all along the sidewalk, and many families found shelter underneath them. I tried to look inside a tent. I could only see colorful, ripped clothes hanged in front of the tent. A woman washed her skinny naked children. As I got closer to them, they started begging me for money. I gave away some change. As other families saw me, they came closer. I found myself surrounded by tens of people begging for money. I threw some rupees in the air, and as they tried to pick the money up I ran away. Want to read the rest of the book? See panel above left! If you enjoyed reading the above article then you will probably also enjoy Borneo, also in Asia, and our latest articles covering the Orinoco Delta, La Mata, Marbella and Beijing.